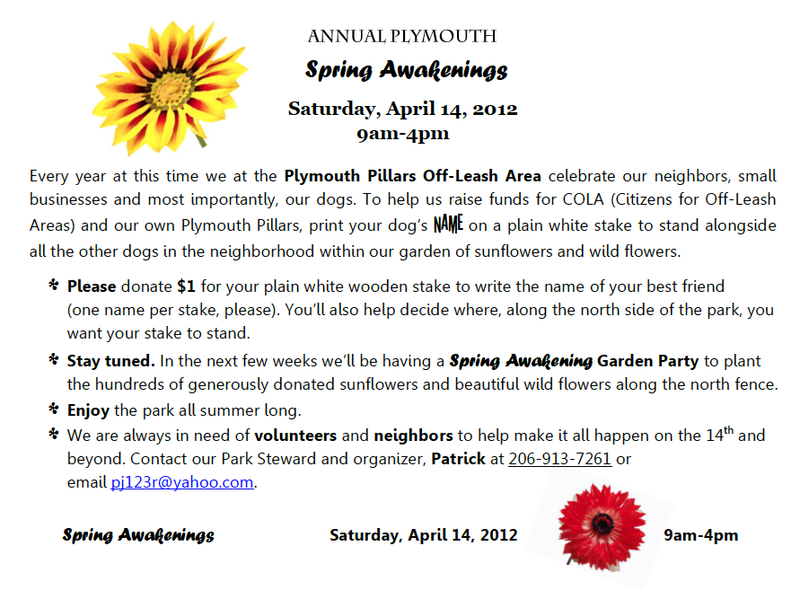 If you and your furry friend(s) have been patrons of the Plymouth Pillars Off-Leash Area lately, you’re probably aware of this Saturday’s event to plant white stakes emblazoned with neighborhood doggy names alongside the sunflower garden. Dogs are real ego hounds so they dig seeing their names in print. Dogs also like monogrammed towels. For any egotistical dogs in the Capitol Hill area not aware, you family members better get on it. Details on being part of this Saturday’s fun are below. Pillars Park champion Patrick Jones also reminds that there will be music in the park all summer starting June 1st. If you’re interested in performing, drop pj123r@yahoo.com a line or visiting the off-leash area’s MySpace page. What? Doesn’t your off-leash area have a MySpace page? After running into that Patrick Jones guy in the Pillar’s off leash area I now actively avoid him when I’m there. Something seems a little strange with him, even a little creepy. Why did he take a picture of my dog and post it online without even as much as asking before he did so? Why did he tell me, my wife and two young children not to bring drugs into the park, because he would chase anyone off for doing so? Why is he always there, and why am I left with the impression that he thinks the park is his private little fief? Any more information about what is happening with that guy? I recently brought an energetic dog from the country to Capitol Hill. The Pillars Park is the only reason my dog has become a happy city dog. It’s a great park and Patrick does a lot of work to make it as nice as possible. I have seen many dog parks with websites and Facebook pages (like Genesee) that regularly post pictures of the dogs that come out. Cityzen sounds quite unnecessarily paranoid. I’m not lying, that Patrick guy did not ask permission to take the photo. Also I didn’t say that guy said “not to bring dogs to the dog park”. Sheesh, where did you learn to read? 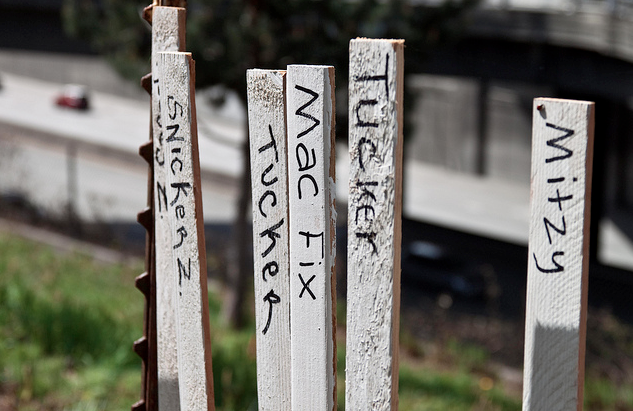 Illiteracy kills, perhaps it’s time for a refresher course. I don’t think you know what “paranoid” means. Approaching strangers to take pictures of their pet without asking is weird. Maybe if he announced he was the “steward” of the dog park first it wouldn’t be so weird, but he didn’t. And there’s nothing “paranoid” about that.